Long time prospector, Scott Hanson, and I recently got together just after we discovered that The New 49’ers have acquired yet another new claim downriver from Happy Camp. Scott suggested that we invest a couple of days sampling the new claim (K-22A) along with a few other places where members have been doing pretty well this winter. On that note, I will say that it seems like we have more members actively prospecting this winter than during the past few years. There are a lot of friendly faces around Happy Camp! Scott and I first stopped at the Club’s newest claim (more on that below). It is called the “Doolittle Rapids.” This is because the upstream boundary is about where Doolittle creek enters the Klamath River. 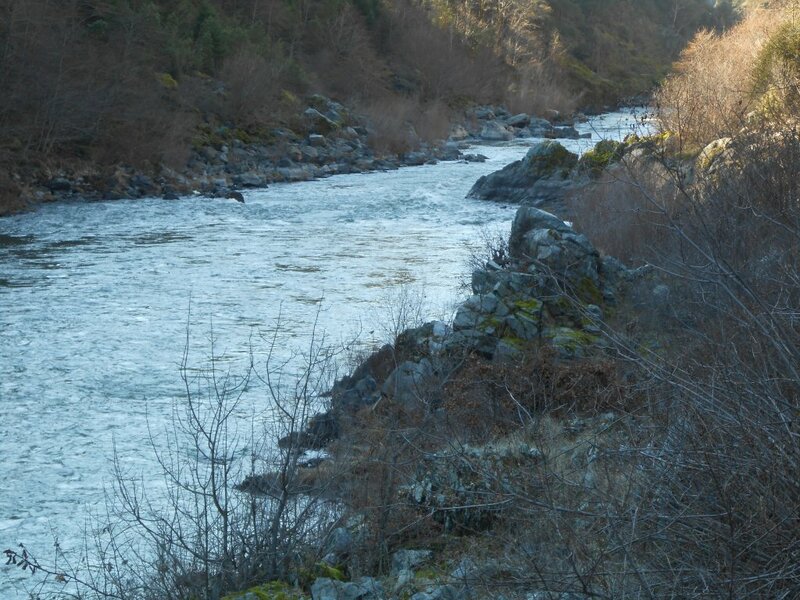 There is a magnificent set of rapids in the Klamath River just downstream. It’s really more like a small waterfall in a big river. Our hike down to the river was a little steep, but we managed it alright. 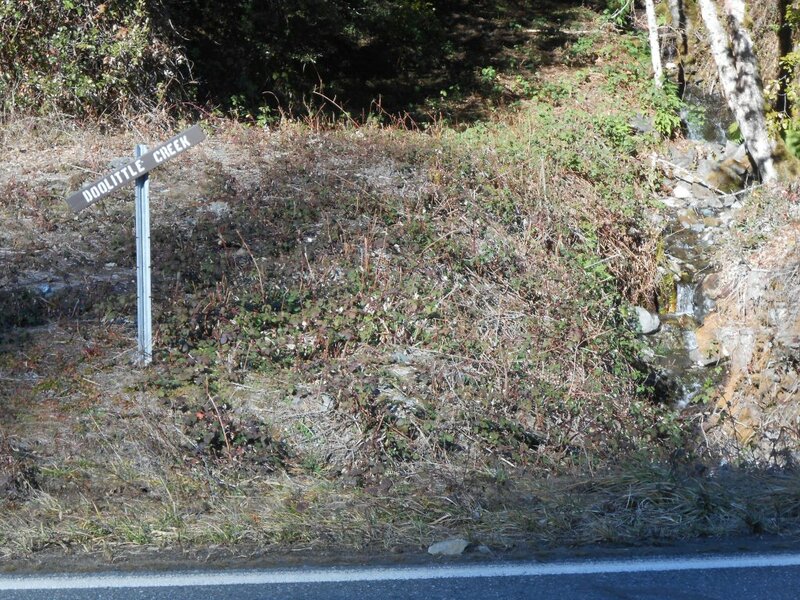 I expect that some increased traffic will make the old trail better. Once we got down to the bottom, the amount of exposed bedrock visible on both sides of the river was almost overwhelming. By this, I mean there were so many sampling options that it was difficult to decide where to start. This is another claim that will keep our members busy for many years to come! Scott finally decided upon a likely spot to find gold and started sampling while I took a few videos and paused to relax on an outcropping of bedrock by the rapids and take in the very dramatic river scenery. Frankly, I was taken aback by the peacefulness from just being there. I live along the Klamath River. So sometimes I forget to slow down and appreciate the surroundings. This was one of those times when I remembered that this is one of the most beautiful places on the planet. There was an osprey flying the river, hunting for lunch. What a view! That's pretty good for one pan! 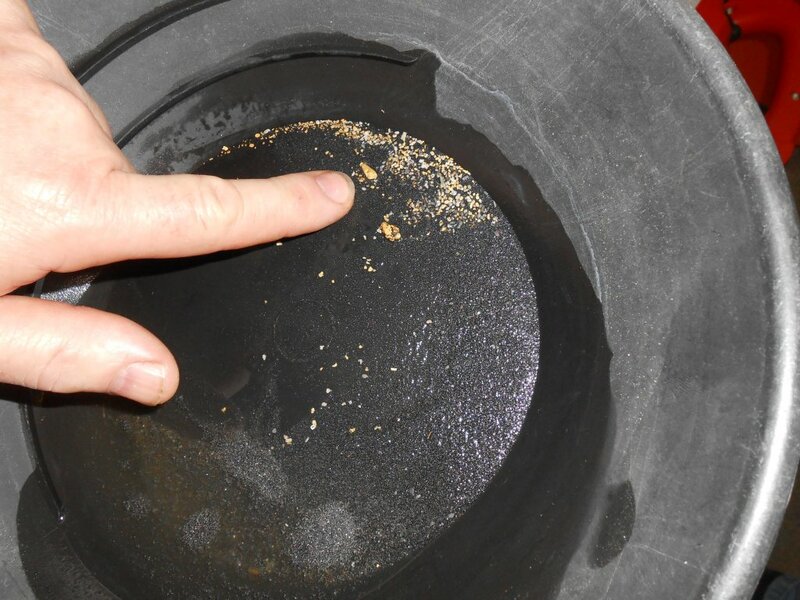 Scott finished his first test pan from surface material alongside the river and found about 30 small pieces of nice shiny gold. That was enough to get me up and helping! We tested at four different places along the claim. 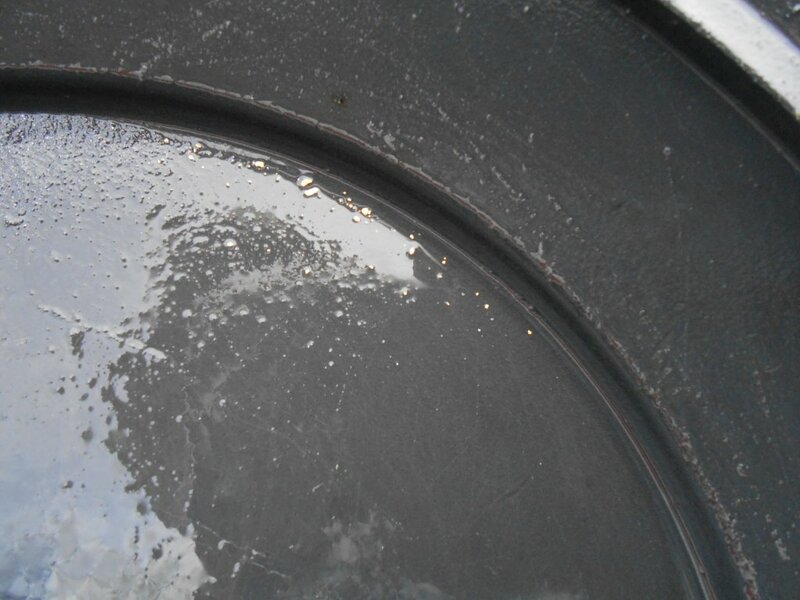 All the pans of surface material contained the same amount of gold. We only brought along a scoop for digging on this first trip, and the larger rocks were preventing us from reaching bedrock in the deeper bedrock traps. So we will return on another day with a crow bar and some crevicing tools. Next we went down to the new Ukonom Gold Claim (K25AA). This is the new claim that was released in last month’s newsletter. I showed Scott a newly-discovered trail down to the river that is on the upriver end of the claim. Last month’s story was about a prospecting trip we did on the lower end, maybe a mile downstream. We did several test pans at the bottom of this new trail and found even more gold and larger flakes. The Ukonom claim, much like Doolittle Rapids, is close to the river and is mostly about crevicing and breaking open the bedrock. There are a couple of creeks there that enter the river from the south side. I suspect they are the source of some of the gold we were finding, because the gold was chunkier then what we normally find. 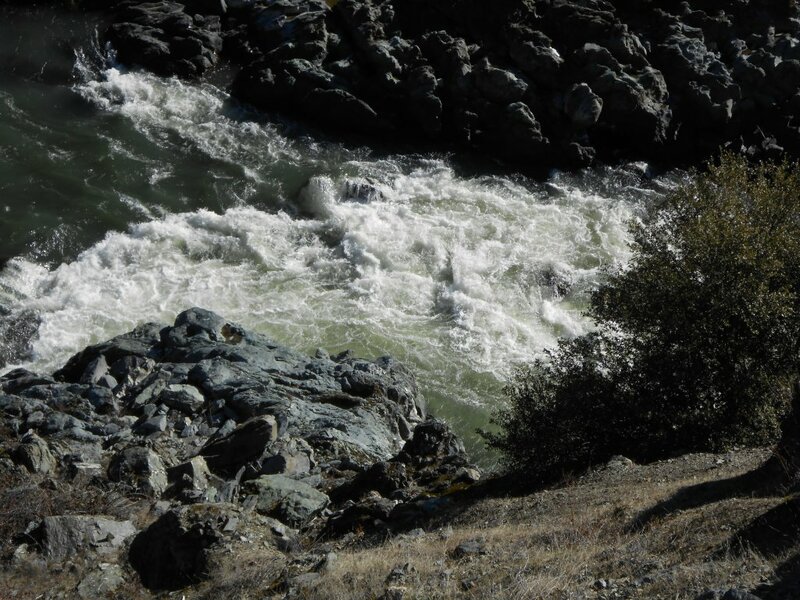 Talking about crevicing, the Klamath River has now been running about 3,000 cubic feet per second slower than the seasonal average for over a month. Absent any huge storms in March or April, I am predicting we are going to have access to a lot more of the gold deposits that are normally underwater on the edge of the river. This could be really good for this new method of blowing that some members were using late last season to help clear out submerged cracks in the bedrock. The office and Rich Krimm have been receiving phone calls from members asking about the increased opportunities for working bedrock now that it appears there is going to be some very low water this season due to the lack of rain. Let’s keep our fingers crossed! I am aware of a member who had recently brought some incredible gold into the office (image at the beginning of this story). I mean breathtaking! It turns out that he recovered the gold from cracking open bedrock at our K-23A claim at Wingate. 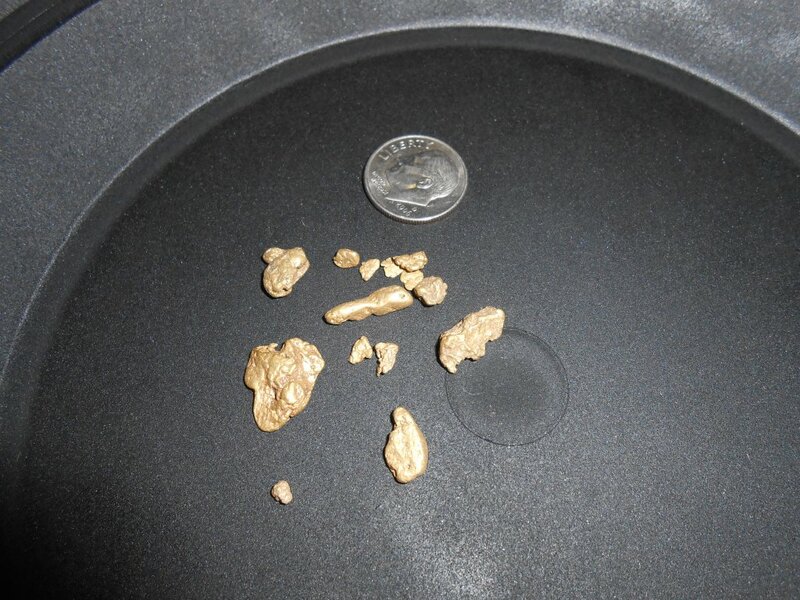 A lot of our members have recovered plenty of gold at Wingate. But this was the first batch of big gold I had seen. So on the following day, Scott and I decided it would be good adventure to go down and look for ourselves. We took a pry bar and my vack machine down there; dug up a few places; and we actually recovered a couple of nuggets. We are definitely going back there to find their big brothers! All in all it was a fun two days of sampling and both of us were impressed by the amount of gold we recovered. Lack of rain, for the most part, has made this a pretty good winter for prospecting. 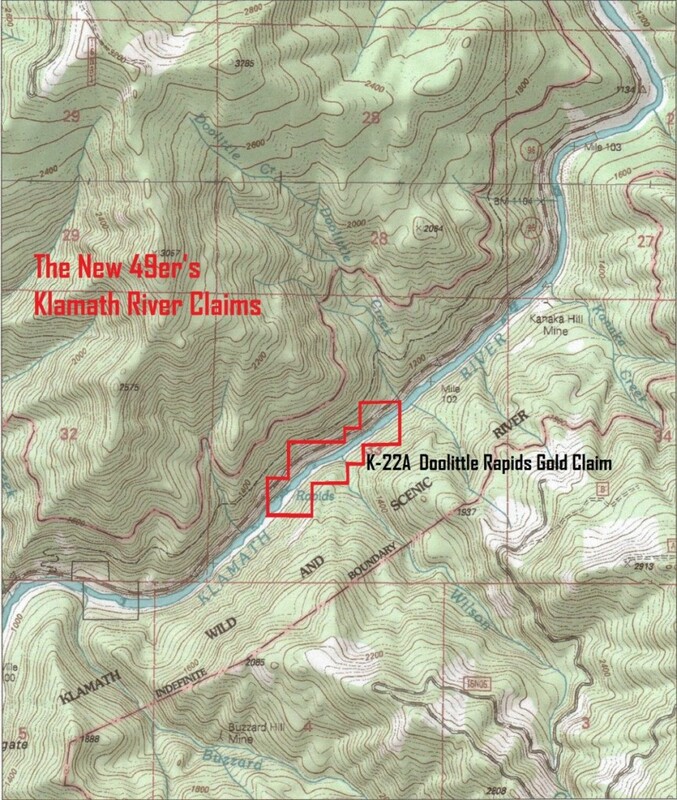 Another New Claim on the Klamath River! 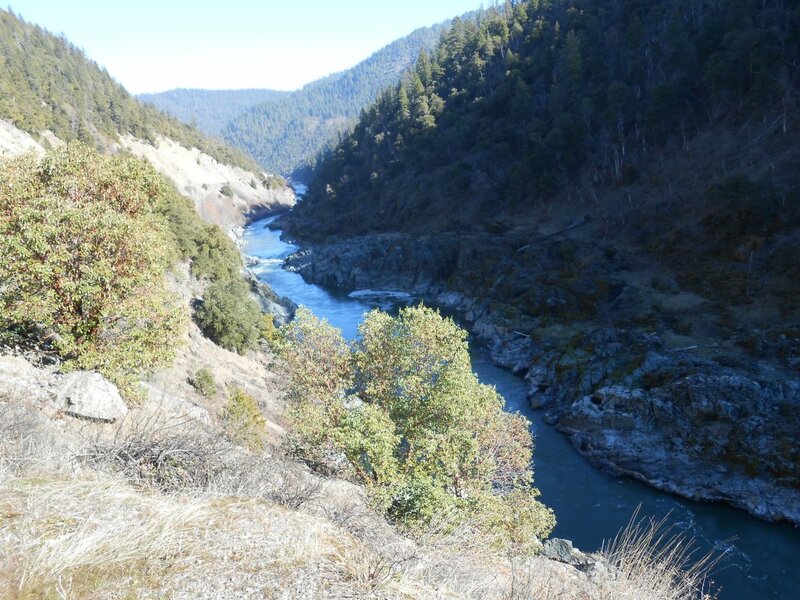 K-22A Doolittle Rapids – is another extension of a very long stretch of contiguous river claims available to members which now extend over 8 miles to our Richardson Bedrock property a short distance upstream from Happy Camp. The lower boundary is located at Highway 96 mile marker 35.5. This new claim is mostly canyon property where few prospectors have been before. Some primitive paths and trails are present to gain access, mostly up towards Doolittle Creek. PROSPECTS: The claims upstream have produced rich gold deposits from top to bottom, with members recovering many, many ounces over the years. A lot of suction dredging was done upstream of the canyon several years ago. There has also been some productive dredging activity in and around the lower end of the canyon. There is exposed and shallow bedrock on both sides of the river, creating completely unexplored above and below water crevicing opportunities. 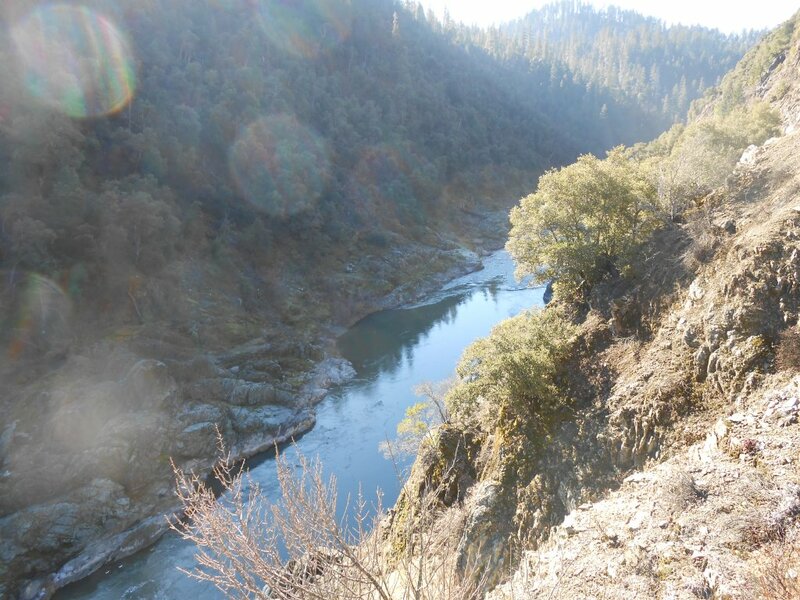 For the most part, this long stretch of river has not been prospected or mined, and the prospects for finding high-grade gold are exceptional. 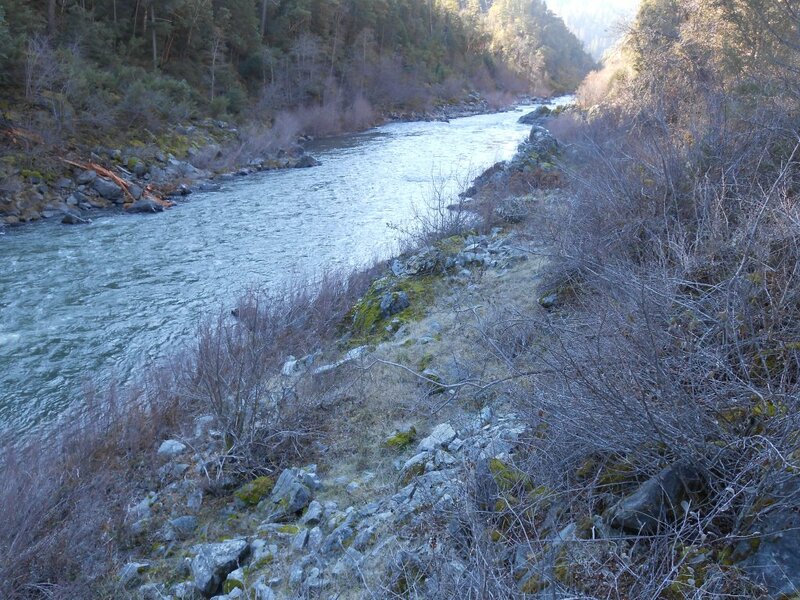 3) The jury is out on the legality of underwater gravel transfer in Siskiyou County. This is because my own understanding is that a Temporary Restraining Order (TRO) remains in affect preventing the Department of Fish & Wildlife from enforcing the Emergency Regulations which put a stop to underwater gravel transfer mining last summer. Since that litigation was transferred to San Bernardino, the TRO kind of remains in legal limbo. My guess is the wardens would frown on the practice. The Club would likely help defend against a citation, though. On that note, I believe the Emergency Regulations will expire once and for all on the 1st of July. 4) There is no problem with booming (motorized suction mining) 100 yards or more from the active waterway. Doing suction gravel transfer closer than 100 yards, in Siskiyou County, remains in the same legal limbo outlined in the paragraph above. You might or might not get cited if the wardens even take an interest. There has not been much interest so far. 5) Underwater crevicing is what most active members were doing within the waterways at the end of last season, using the hookah and pump from their 5 and 6 HP motors on floating platforms to provide air for breathing and a small jet of water to help move material out of the way. I was planning to focus the February newsletter on this method of “underwater blow mining,” but the flu that is going around has prevented us from doing the underwater demonstrations on video. You will see something in the March newsletter. But just to give you something to think about, it is quite easy to rig a blowing hose and blow-nozzle from a small pump to facilitate the excavation of hard-pack on the bottom of a stream, or push small amounts of material out of the way. There is even a way to push (blow) material through a hose to a recovery system without using any suction system on the bottom. The nature of legal sometimes requires that we remain completely silent on issues we get involved with. That’s why this is the first you guys have even heard of this. Some things you will never hear about. We know you have faith that we are doing our best to support small-scale miners, because you have continued to stand behind our efforts. Thank you for that! The main briefs have been filed with the Third Appellate District of California in the Brandon Rinehart case. Many of you will recall that Brandon was cited last year for operating a suction dredge in California without a permit. With financial assistance from PLP and others, Brandon hired our attorney, James Buchal, to defend against the criminal citation. Brandon’s defense was largely based upon our federal preemption argument in San Bernardino Superior Court that the State does not have the authority to prohibit suction dredging, and that their refusal to issue a permit amounted to a prohibition. The judge in that case rejected the preemption argument on the presumption that we would appeal to the Appellate Court. Now that the Appellate Court will consider federal preemption, we are on a fast track to get this very important issue decided. James Buchal did a fantastic job in presenting opening and closing arguments. I encourage you guys to read them, because they are very enlightening. The State’s argument is basically that congress never meant for the State to be prevented from stopping mining on the public lands. Anti-mining activists have also weighed in with their own arguments. So that you can more easily follow along in the progress, we have created a special page on our web site that includes all of the important briefs. In the event that we win the federal preemption argument, my guess is that suction dredge permits will again immediately be available in California. This, because a judge will have ruled that we can dredge even if California fails to issue permits. It is impossible to predict how long it will take the Court to issue a Decision. But it is possible it could happen before this next season. We are providing financial assistance to pursue the preemption argument in the Appellate Court, since that outcome is likely to resolve many of the unsettled matters in San Bernardino Superior Court. At the time we are publishing this newsletter, the State of Oregon has yet to issue final regulations how they will administer these changes, and Oregon State Lands is not yet processing permit applications. Last Chance to Win Gold & Silver! As most of you know, we mostly generate money to pay lawyers through our New 49′er Legal Fund-raisers. The ongoing fund-raiser will give away 25 prizes in all: The Grand Prize is a 1-ounce American Gold Eagle. 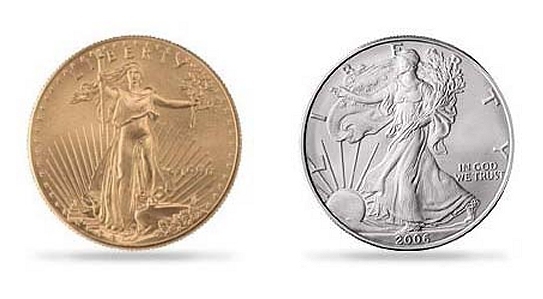 There are four ¼-ounce American Gold Eagles. There are ten 1/10th-ounce American Gold Eagles. And there are ten 1-ounce American Silver Eagles. This drawing will take place at our offices in Happy Camp on 28 February 2014. You do not need to be a member of our organization to participate. You do not need to be present to win. There is no limit to the size or frequency of your contributions, or to the number of prizes you can win. Legal contributions can be arranged by calling (530) 493-2012, by mailing to The New 49′ers Legal Fund, P.O. Box 47, Happy Camp, CA 96039, or online by clicking here. The drawing is only two weeks away and hardly anyone has joined in so far. So your chances of winning are pretty good! Thanks for whatever you can do to support our defensive efforts! Lost Treasure Hunters Scheduled to Air! Just as we are going to print with this newsletter, I have received notice from the producer that Animal Planet has scheduled the full version of Lost Treasure Hunters (5 episodes) to play, starting at 8 AM on March 6th. Episode 1 can be found here. I don’t know the times for each time zone. You might consult your local listings. I wanted to let you know, since it is unlikely there will be another newsletter before March 6th. 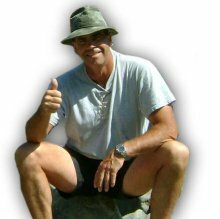 Lost Treasure Hunters is a reality show that was filmed by Discovery Network about several friends and me who went on an extended expedition to India in search of one of the world’s richest diamond mines, a mine that has been lost for several hundred years. I am not allowed to tell you if we found the mine. But I can tell you that if you watch the show, you won’t be disappointed in what we found! It would be good if you guys spread the word around so we can get the ratings up. This, because I have been talking to the network about doing a second season in the Philippines where we have located a Spanish galleon!! Television networks are more receptive to new projects when past ones have had good ratings.